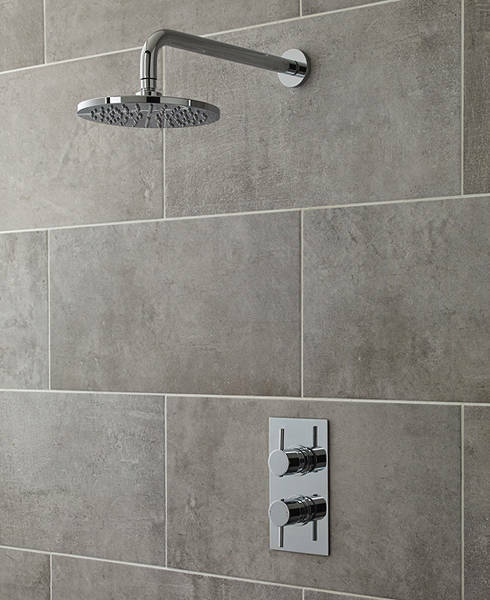 Ultra Quest > Quest Thermostatic Shower Valve With Ecco Shower Head. 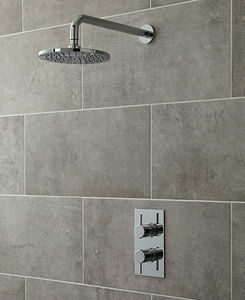 Quest twin concealed thermostatic shower valve in chrome with Ecco fixed shower head. Thermostatic control to +/- 2°C even if the water pressure fluctuates. Suitable for use with all systems: gravity fed, pumped, un-vented high pressure or fully modulated combi-boilers. The cartridge is fully reversible, meaning if hot and cold supplies are the wrong way round, it doesn't need re-plumbing (simply remove the cartridge, turn 180° and replace). This valve is manufactured from solid brass. Minimum pressure required 0.2 bar. 10 Year guarantee: Ultra guarantee this shower set for 10 years. The Ultra Quest range of bathroom taps and showers offers designer good looks with user friendly lever handle operation. Quest is perfect of any contemporary bathroom or cloakroom. 10 Year guarantee: Ultra guarantee their Quest bathroom taps and showers for 10 years. All Ultra taps and showers are WRAS approved.